Heritage Homes of the Valley was established in 1987. 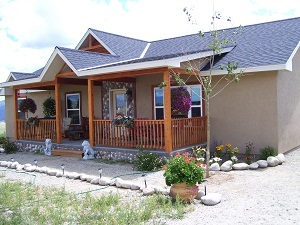 We were the first IRC modular home dealer in Chaffee County. Our mission is to provide an efficient and affordable custom-built home at a guaranteed price. After we design a custom plan for you with the features you want for your lifestyle, the price will be firm. In our local area we can also provide the complete site preparation work prior to your home delivery. From beginning to end, we allow five to six months depending on our schedule and the schedule of our subcontractors. We are extremely proud of our insulation packages – all of which are *Energy Star and *Home Energy Rating System (H.E.R.S.) easily accomplished and certifiable. We work primarily in Chaffee, Park and Lake Counties. We will consider homes in Eagle, Westcliffe, Gunnison and the San Luis Valley (or others) upon request. We invite you to make an appointment to come in and see our simple process of designing your custom home. All of our homes are built to the 2006 IRC Building Codes; the same building code that all residential structures are built according to. Thank you to Heritage Homes who has been in business and a member in good standing of the Chamber for 35 years.